Spectacles where quite common in the Roman empire. Essentially, a spectacle provided a citizen the opportunity to attend a public event and be entertained (all day!) by races, criminal executions, and gladiatorial combats. 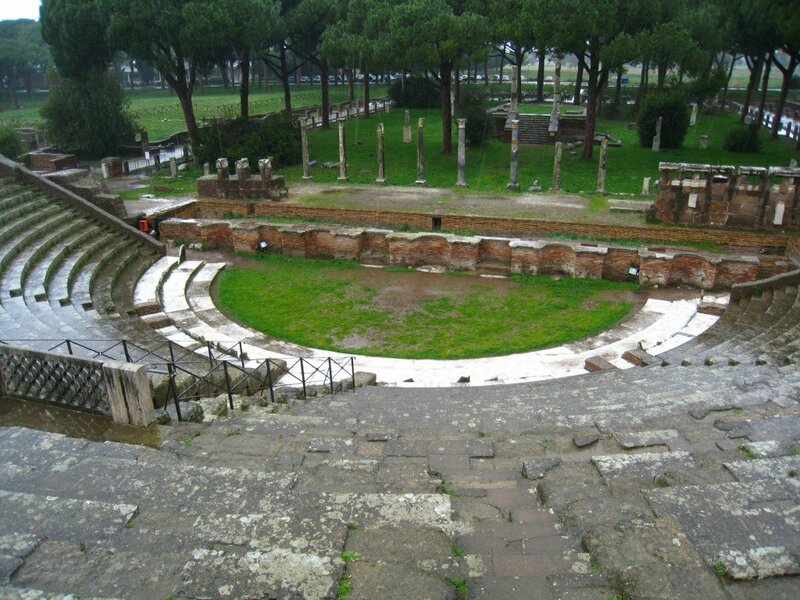 These events would take place in a variety of public venues, including circuses, theaters, and amphitheaters. 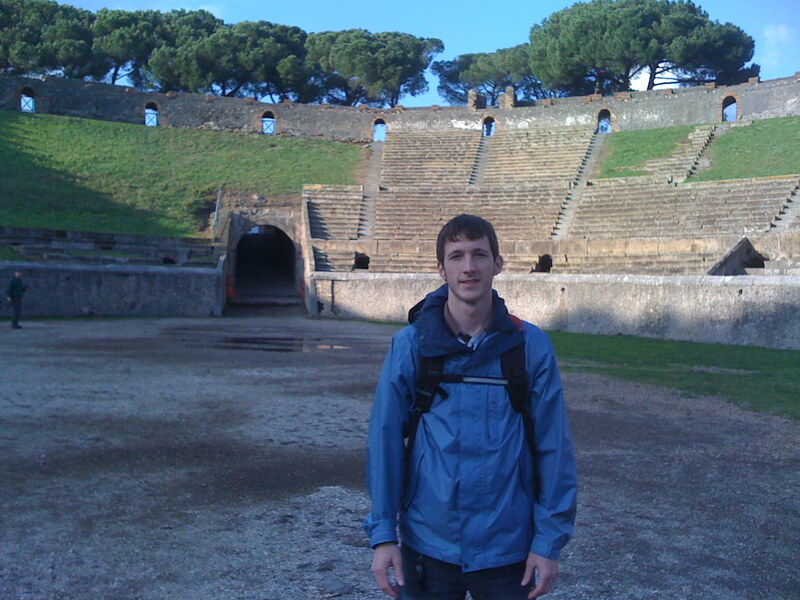 Yours truly: a spectacle at Pompeii! So what sort of spectacle has Paul become? V. Henry T. Nguyen (yes, a biblioblogger) has written an excellent article on the subject. * Following D. G. Kyle’s work** on Roman spectacles, Nguyen contends that the spectacle metaphor Paul uses is not a triumphal procession nor a gladiator show (in the proper sense), but a spectacle in which noxii, defenseless criminals condemned to death, would be brutally murdered. Supporting this perspective in context, Nguyen interestingly suggests that the “refuse” and “scum” in v13 (περικαθάρματα and περίψημα) could be a reference to the dumping of the executed criminal bodies outside the city. The point of Paul’s metaphor is to vividly illustrate what is to be expected for those who embrace “the foolish message of the cross” (1 Corinthians 1:18ff). Paul sarcastically claims that the Corinthians “have become rich…have become kings” (1 Corinthians 4:8), but he says that he has become the refuse and scum of the world. What a contrast! Who would want to embrace the message of the cross? This is why Paul says, “For the word of the cross is foolishness to those who are perishing, but to us who are being saved it is the power of God” (1 Cor 1.18). *Nguyen, V. Henry T. “The Identification of Paul’s Spectacle of Death Metaphor in 1 Corinthians 4.9” New Testament Studies 53 (2007), 489–501. **Kyle, D. G. Spectacles of Death in Ancient Rome. London: Routledge, 1998. The emergent generation of Christian leaders needs a fresh vision of the gospel’s power. As a student and professor, I need this regular reminder. Living and giving the gospel is the greatest accomplishment of any day. It is easy to allow important institutional and academic responsibilities to distract from being a gospel spectacle in the public arena. Appreciate this post! Thanks, Thomas. I can usually count on Paul to knock the wind out of me any time I begin to puff up!